This metadata file is a record for a collection of 32,705 orthorectified aerial photo images of the area around the International Boundary of Montana that are available at the Montana State Library. 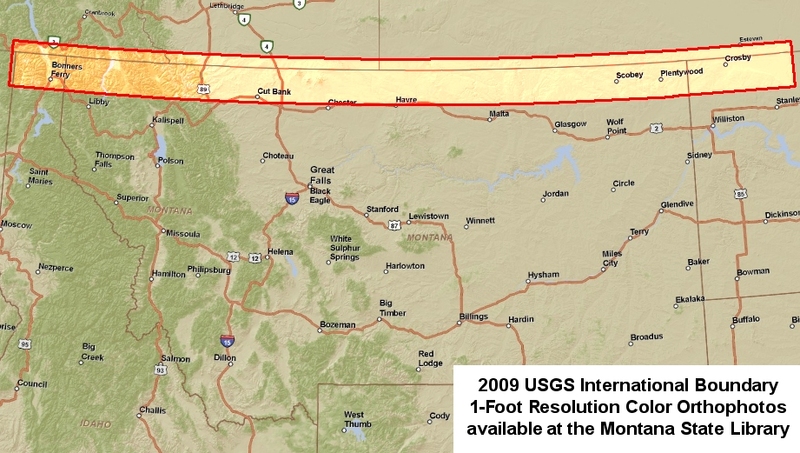 Data for the entire International Boundary between the U.S. and Canada are available from the U.S. Geological Survey or from various state governments. The collection at the Montana State Library covers an area extending 30 miles south and 10 miles north of the border, and from 4 miles west of the Washington-Idaho boundary to Kenmare, North Dakota, about 90 miles east of the Montana-North Dakota boundary. Except where this metadata specifically refers to the Montana State Library, it was written by 3001, Inc., the producer of the images, to describe a single example from the image collection. An index of the image names and photography dates is available at http://ftp.geoinfo.msl.mt.gov/Data/Spatial/NonMSDI/Shapefiles/Orthophoto_Index_Border_2009.zip. An orthoimage is remotely sensed image data in which displacement of features in the image caused by terrain relief and sensor orientation have been mathematically removed. Orthoimagery combines the image characteristics of a photograph with the geometric qualities of a map. For this dataset, the natural color orthoimages were produced at 0.3-meter pixel resolution (approximately 1-foot). The design accuracy is estimated not to exceed 6 meter horizontal RMSE for locations within the United States. Each orthoimage provides imagery for a 1500-meter by 1500-meter block on the ground. The projected coordinate system is UTM with a NAD83 datum, spheroid GRS80. There is no image overlap between adjacent files. The naming convention is based on the U.S. National Grid (USNG), taking the coordinates of the SW corner of the orthoimage. These data have been created as a result of the need for having geospatial data immediately available and easily accessible in order to provide geographic reference for federal, state, and local emergency responders, as well as for homeland security efforts. Orthoimages also serve a variety of purposes, from interim maps to field references for earth science investigations and analysis. The digital orthoimage is useful as a layer of a geographic information system. These data can be used to provide reference information for web browsers and for map applications at a scale of 1:100:000 or smaller. There is no guarantee of warranty concerning the accuracy of the data. Users should be aware that temporal changes may have occurred since this data set was collected and that some parts of this data may no longer represent actual surface conditions. Users should not use this data for critical applications without a full awareness of its limitations. Acknowledgement of the originating agencies would be appreciated in products derived from these data. Any user who modifies the data is obligated to describe the types of modifications they perform. User specifically agrees not to misrepresent the data, nor to imply that changes made were approved or endorsed by the U.S. Government. Data set credit: 3001, Inc. Sample points taken from overlapping areas of adjacent image strips that contributed image chips to each orthophoto tile are typically consistent to the 2-3 pixel level. This not only ensures that a consistent mosaic can be created from the adjacent image strips acquired with the ADS40-II pushbroom scanner but also means that the images have good precision and as a group are spatially self-consistent. Compliance with the accuracy standard was ensured by the use of photo identifiable ground control points and/or the collection of airborne GPS data. Pixels outside the project boundary are represented with the numeric value of 0,0,0. The accuracy value for locations within the United States was determined by measuring photo-identifiable control points collected with GPS survey methods in the orthophotos. Aerial imagery was captured with a Leica ADS40-II Airborne Digital Sensor. Ground control consisted of photo identifiable surveyed points within the United States. The imagery was collected at an average altitude of 9500 ft above mean terrain (AMT) using an ADS40-II digital sensor. Image quality was verified during the post flight review phase. Factors considered during this review included but were not limited to the presence of smoke and/or cloud cover, contrails, light conditions and sun glint. The triangulated strips were rectified with a recent DSM of the area provided as GFI (SRTM2, DTED2, Intermap NEXTmap USA, Canada NED, Mexican Border Lidar), and supplemented with higher resolution DSM data where readily available. The vertical accuracy of the DSM varies based on the elevation postings of GFI products and requirements thereof. The red, green, and blue bands were combined to generate a natural color orthophoto. The ADS40-II sensor collects twelve bit image data which requires radiometric adjustment for output in standard eight bit image channels. Converting to eight bit results in a reduction of the color range from 4096 to 256 - thus loss of radiometric detail is inevitable. The extra dynamic range of the sensor permits greater object differentiation in shadows and in bright areas. The twelve bit dynamic range permitted the imagery to be more effectively color balanced than is possible with eight bit imagery. This was accomplished by performing tonal enhancements immediately prior to the reduction from twelve bit to eight bit data. In addition to color balancing, these eight bit images were adjusted to create seamless imagery to the highest extent practically achievable. The imagery was mosaicked using a combination of automated and manual seamline generation. Project specified tiles were extracted from the mosaic to produce a natural color digital orthophoto image map. Final image tiles were reviewed for artifacts and anomalies and adjusted as part of quality control procedures. When necessary, local corrections to the imagery were performed to minimize such effects. Natural color orthoimagery is organized in three color bands or channels which represent the red, green, and blue (RGB) portions of the spectrum. Each image pixel is assigned a triplet of numeric values, one for each color band. Numeric values range from 0 to 255. Pixels outside the project boundary are represented with the numeric value of 0,0,0. Contact the Montana State Library to request copies of the images. To see the area covered by each image and the image dates, see the shapefile at http://ftp.geoinfo.msl.mt.gov/Data/Spatial/NonMSDI/Shapefiles/Orthophoto_Index_Border_2009.zip. Each of the images is 75 megabytes in size, and the entire collection of 32,705 images is 2.3 terabytes. We may ask that you send us an external hard drive for us to copy the images to if you request a large collection of them.